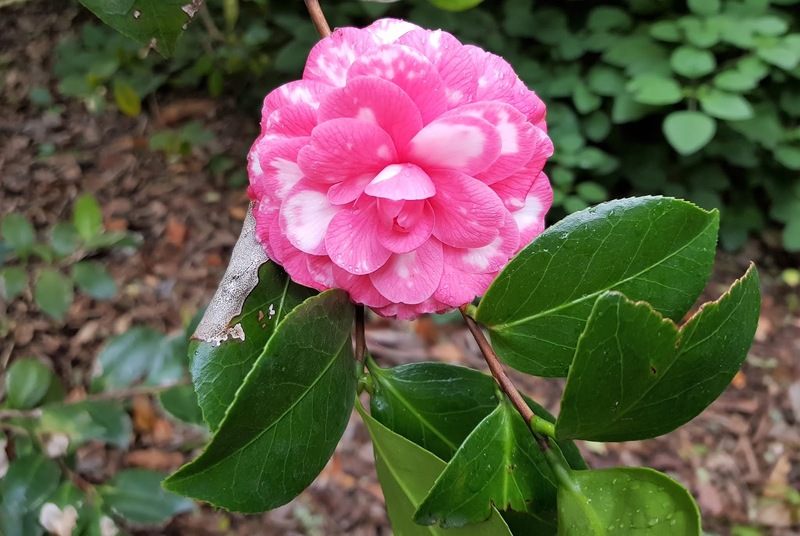 Look carefully at this camellia bush and you'll see two different kinds of flowers. This isn't due to a some crafty graft but to a single plant expressing attributes of two very different parents in spontaneous and odd ways. After last week's light introduction to the genetic mutations called sports, which end up as new cultivars of Camellia, I want to get to the heavy stuff today, a chimera (or, if you like, a chimaera). 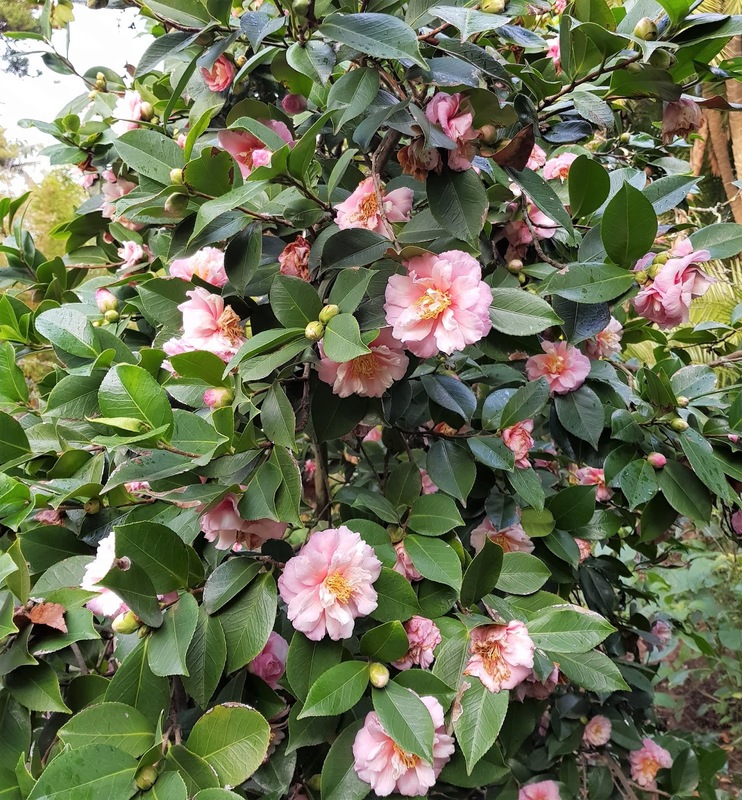 My example is a specimen in Melbourne Gardens labelled Camellia + 'Daisy Eagleson'. I didn't know what the '+' meant so I asked my guide Jenny Happell (see last week's post) who said it was short hand for what I later discovered, after reading the 1972 paper by the US agricultural scientist R.N. Stewart and colleagues, was the (at that time) "third, fully-authenticated, woody graft chimera". The plus sign is used for a chimera resulting from a graft. Let's start at the bottom, under the soil. 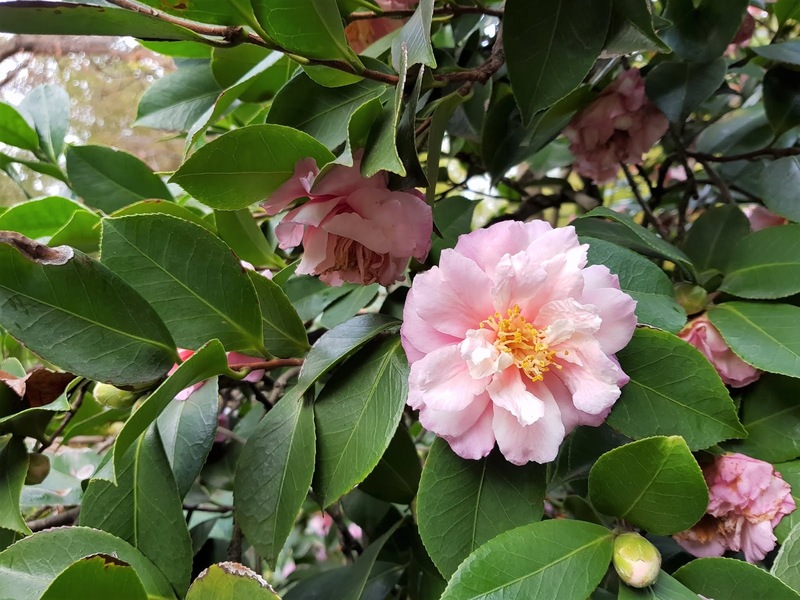 There you'll find as rootstock a cultivar of Camellia sasanqua called 'Maiden's Blush'. 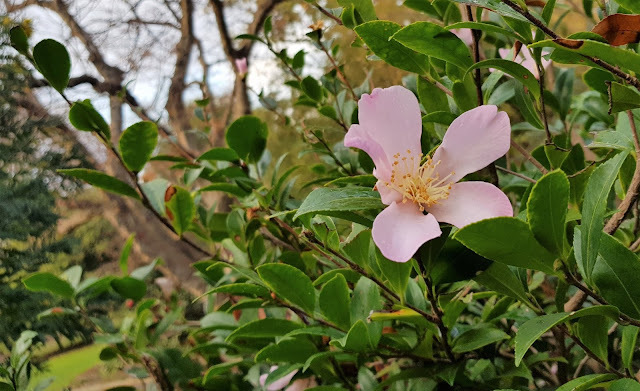 Like all Camellia sasanqua it produces relatively small, narrow leaves (as above) if allowed to flourish above the ground. In this case though, a Camellia japonica has been grafted onto the top of this rootstock plant. 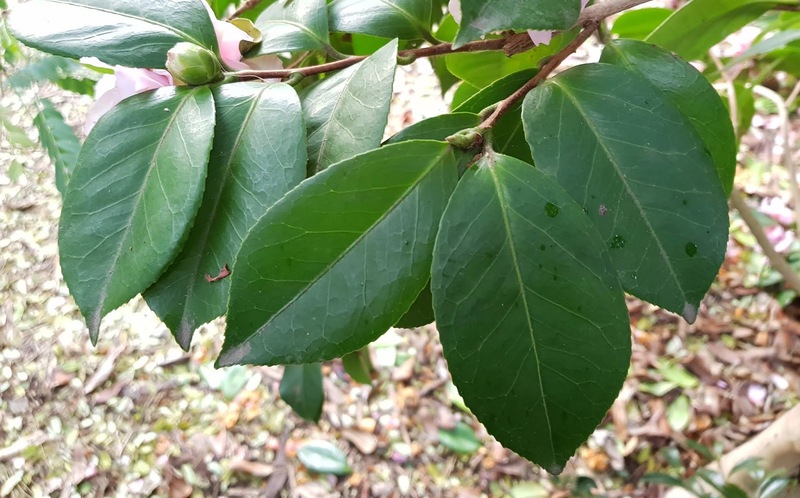 Camellia japonica has relatively large leaves, like this next picture. Both images are from the same Camellia + 'Daisy Eagleson' bush. Now a chimera is in Greek mythology a fire-breathing creature, made from the parts of various animals. In real-world biology it is an individual containing at least two different sets of DNA, often due to fused eggs. In the botanical world we most often use the term for a plant containing a mixture of genetically different cells or tissues resulting from a graft. In 'Daisy Eagleson', the outside (epidermal) tissue of each stem comes from the smaller leaved Camellia sasanqua and the internal tissue is the larger leaved Camellia japonica. These two tissue lines are apparently running independently throughout the plant, which is unusual. We expect the rootstock to stop at the graft, and all the plant tissue above this is the fancy plant you've added. The two species have different chromosome numbers (the rootstock has six sets - hexaploid - and the grafted on species two sets - diploid) as well as significant differences in leaf and flower size and form. This is unusual. Most chimeras are between plants that differ only slightly. In this odd 'hybrid' arrangement there are sometimes a combinations of characters and other times 'pure' expressions of either parent. We have four specimens of 'Daisy Eagleson' in Melbourne Gardens, on the right hand side of the African Tunnel Bed (see last post). Mostly you see something more like a Camellia japonica but every now and then the Camellia sasanqua breaks through. We are used to this kind of thing at the base of a plant, where rootstock starts to grow and might even take over the plant grafted on to it. Not, as occurs here, at unpredictable locations throughout the plant. 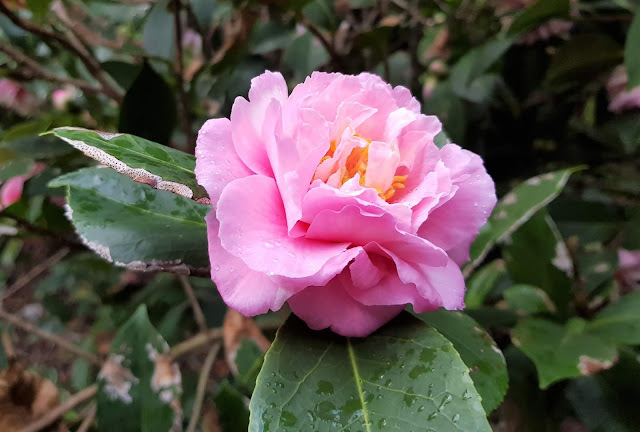 Mostly (at least when I looked in July) the flowers on our four plants are of hybrid origin, matching the 'Daisy Eagleson' cultivar form, and the leaves are mostly intermediate between Camellia japonica and Camellia sasanqua or perhaps a little more like typical Camellia japonica. 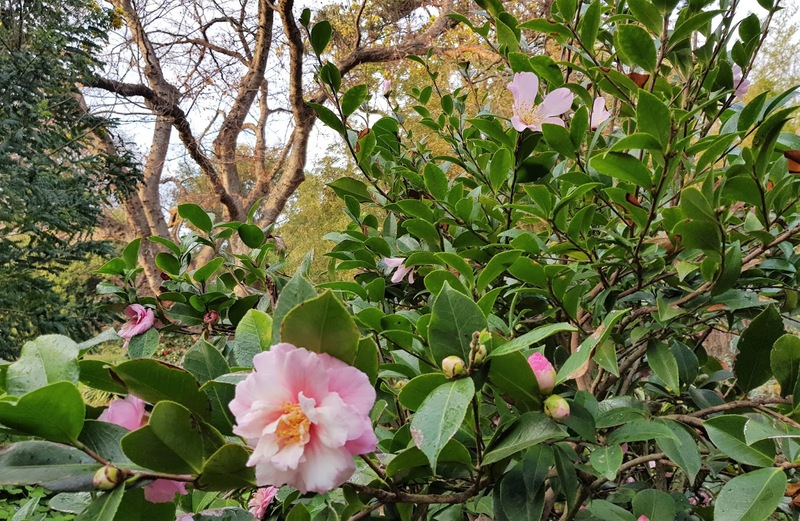 The fragrance though is pure Camellia sasanqua (in another major difference, the Camellia japonica has no perfume), as is the colour (although the second bloom above is getting darker in hue). Occasionally there are Camellia japonica flowers, which have not visible male or female parts in their middle. Stewart describes these as "dark-rose coloured, white-blotched, completely double, tiered and sterile". This is one here. And then, every now and then, you can see a branch emerging with not only smaller leaves but also the pale, smaller single flowers of the rootstock species, Camellia sasanqua. The original graft was made by Tom Eagleson, in Texas in 1954, naming the result after what I presume to be a significant woman in his life. Cuttings have been made from this plant, including two in 1960 which formed the basis of the Stewart study published in 1972. As they note in this paper, selective pruning can be used to produce more of one of the 'parents' or more of the mixed parentage tissue. Our four specimens have not been selectively pruned and you can see some variation in flower (and leaf) form as the different components of this chimera dominate. If you get close enough you might pick up one of the intriguing novelties in the 'Daisy Eagleson' flowers: 6-8 yellow styles (the female stalks in the middle of the flower) rather than three in both the parent species (although not visible in the Camellia japonica flower).